It’s been 20 years since Guillermo del Toro made his directorial debut with Cronos; since then he’s made Oscar-winning dark fantasy (Pan’s Labrynth), a Spanish Civil War allegory in the guise of a terrifying ghost story (The Devil’s Backbone), elevated second-tier comic book characters to cult film status (Blade II and the Hellboy films), and toiled in the slave mines of Hollywood for-hire schlock (Mimic) — and those are just his directing credits. 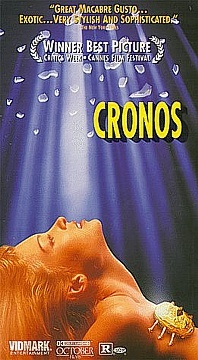 Yet, as good as those works have been, none of them come close to capturing the freewheeling creativity or unbridled energy that drives Cronos, the movie that instantly established del Toro as an auteur to watch. While Jesus and his beloved granddaughter Aurora (Tamara Shanath) try to deal with the mounting horror of the situation, an invalid industrialist (Buñuel veteran Claudio Brook) learns of the device and dispatches his brutish nephew (Ron Perlman) to obtain it. Del Toro (just 29 years old at the time) puts his cinematic influences on full display, from the classic horror movies of Universal and Hammer studios to the magical realism of classic Mexican and Spanish cinema. Also present are the various themes and tropes that have since become the director’s trademarks (insect and clockwork imagery, religious iconography, imperiled children, gratuitous Ron Perlman, etc.) as well as his distinct, moody visual style. Unlike a lot of first-timers, del Toro never lost sight of the human element of his story, focusing on the characters as much as the mechanics of the plot and infusing genuine emotion into the works while exploring the double-edged sword of immortality — some noticeably missing from modern horror movies. As with other classics of the genre, del Toro’s “monster” turns out to be the most human, sympathetic person in the story. Professional film critic, journalist, Byronic hero.